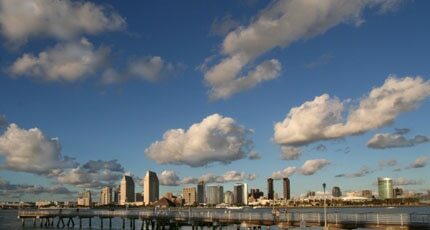 San Diego is known for its perfect weather, sandy beaches and miles of gorgeous coastline. It's the ideal location for vacationers in search of relaxation and nature, but it also offers up some adrenaline-inducing thrills as well as cosmopolitan pleasures. From high-class restaurants and trendy clubs to world-class amusement parks and epic surf spots, San Diego truly has it all. So, here's your 72-hour itinerary for a bit of sophisticated fun in the sun in beautiful San Diego. Before you go, consider getting a CityPass to save up to 50 per cent off the price of regular admissions to some of the city's finest attractions. For this adventure, you will need a rental car. Your first stop, one of our favorite hotels, is just a short jaunt southeast from the San Diego International Airport. The stylish Andaz Hotel in the historic Gaslamp District is set in the former 1914 Maryland Hotel in the hub of the city. Andaz's transformative design is both sleek and sophisticated, its rooftop lounge is one of the best cocktail bars in downtown, and its signature restaurant Katsuya is great for sushi. While the Andaz hotel is our top choice, San Diego offers plenty of places to stay. Options include the Hard Rock Hotel San Diego (also in the Gaslamp), featuring one of famed restaurateur Nobu Matsuhisa's outposts. If you'd prefer to stay outside the city, head northwest to The Lodge at Torrey Pines where you'll find Craftsman-style architecture and a fabulous golf course adjacent to the seaside property. Or opt for L'Auberge Del Mar, a cottage-style beachside beauty in picturesque Del Mar. Ocean lovers will also appreciate the views and modern design of Tower23 in Pacific Beach. After you've taken in your new sumptuous surroundings, grab your bathing suit and drive along the coast to La Jolla. The first day will be a leisurely one, so take your time and stop to eat at the Brockton Villa — a historic, cliff-side cottage built in 1894, which serves light California cuisine. We like their famous coast toast (soufflé-like French toast made with a hint of orange), crab ipanema (poached eggs on English muffins with tomato, crab cakes and spicy tomato-coconut sauce) and the layered brie (stuffed with Danish blue cheese and fruit). Enjoy the ocean views, which are great for spotting dolphins, sea lions and even whales. To work off a bit of that breakfast, take a walking tour in the nearby village shopping district on Girard Street and Prospect Avenue. Longtime favorites such as Warwick's Books (an independent gem with first editions and signed books), and Let's Go (designer clothes and hip footwear) are interspersed with international chains like Ralph Lauren and Armani. Art galleries abound, including Quint Contemporary Art, Tasende (with selected works of Niki de Saint Phalle, Andres Nagel and Auguste Rodin), Alcala (with Bauer's Rare Books), Images of Nature and the Museum of Contemporary Art, which has a wonderful café open for helmed by favorite local chef Giuseppe Ciuffa. Then head over to one of the sandy beaches for some sunbathing, bodysurfing or snorkeling. If you would like to explore the local sea caves, the Hike Bike Kayak Sports San Diego store is a great venue to rent kayaks (as well as bikes). Stroll south along the coast walkway to what the locals call the "Children's Pool" to see live seals — if you're lucky you might get to chance to see an adorable seal pup! Afterwards, you can relax on a grassy knoll in the Ellen Browning Scripps Park. For a lovely al fresco lunch head to the Ocean Terrace restaurant atop George's at the Cove for endless views of the Pacific and the cliffs of La Jolla. Order chef Trey Foshee's famous fish tacos (lightly-grilled yellowtail, vibrant mango salsa, avocado and shredded cabbage with Jalapeño-lime crème fraîche) and pair it with the perfectly captivating xolo cocktail (Don Julio Añejo tequila with grapefruit, agave syrup and black salt). This culinary experience captures San Diego at its best. Those that aren't too tired can try a little dancing at one of the many clubs in the Gaslamp District, including The Ivy Nightclub, Side Bar, Float at The Hard Rock and Fluxx. If dancing isn't your thing, swing by one of the many pubs, such as The Field, Hennessey's or Dublin Square. We also love Vin de Syrah with its Alice-in-Wonderland whimsical design and wine flights; the always casual Neighborhood for its thorough beer menu; and the über-hip Analog bar where you can karaoke the night away. Even a casual stroll through the Gaslamp can provide ample opportunities for people-watching.